Each time the Runner accesses an agenda from this server, he or she must suffer 2 net damage as an additional cost in order to steal it. This applies even during the run on which the Runner trashes Ben Musashi. 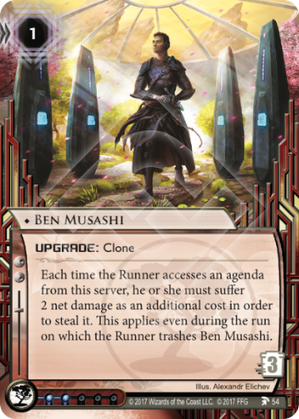 Can the Runner still steal an agenda if they prevent some or all of the net damage incurred by Ben Musashi? If the Runner prevents even a single point of the net damage incurred by Ben Musashi, then they have not paid the additional cost to steal the agenda and therefore do not steal it. Seems good, and definitely synergizes with Obokata Protocol, but I get the feeling that Film Critic is going to be an auto-include again soon, limiting effectiveness. Although if someone doesn't have it, between this, Obokata Protocol, Prisec, Kakugo, and Hokusai Grid, you could make a server that does 9+ damage to steal an agenda. Not bad.